Home » What does Whole plant, Full-Spectrum really mean? With the introduction of single-compound and synthetic cannabinoid based products to the health and wellness market, it’s more important than ever to know the differences between whole plant, full-spectrum phyto-cannabinoid products. Whole-plant products are also referred to as broad or full spectrum extracts. Both refer to the fact that the final product will contain all of the beneficial component found in the natural plant. If you’re using cannabis for medical purposes you’re better off with a whole plant product to ensure you aren’t missing any of the potential benefits the plant has to offer. What Does Whole-Plant or Broad-Spectrum Phyto-cannabinoids Mean? The principal of using the “whole plant” is practiced in many cultures, including modern Western herbalism. The idea is that the activity of the plant is safer, more reliable and effective than extracting isolated chemical compounds from different parts of the plant. Bell Family Dispensary uses 100 percent of its cultivated non-GMO plants in its CBD Oil Tinctures. Hemp contains a symphony of over 400 compounds like cannabidiol (CBD), secondary phyto-cannabinoids, terpenoids, terpenes, and flavonoids. It has an internal “checks and balances” system in place. These compounds work synergistically to heighten the positive, therapeutic effects of cannabidiol and naturally buffer other less desired compounds that come along with the plant. When certain plants have single compounds extracted, these compounds can be toxic, like morphine from the poppy plant or cocaine from the coca leaf. It’s the combination of other plant compounds and chemicals that can inhibit harsh effects. 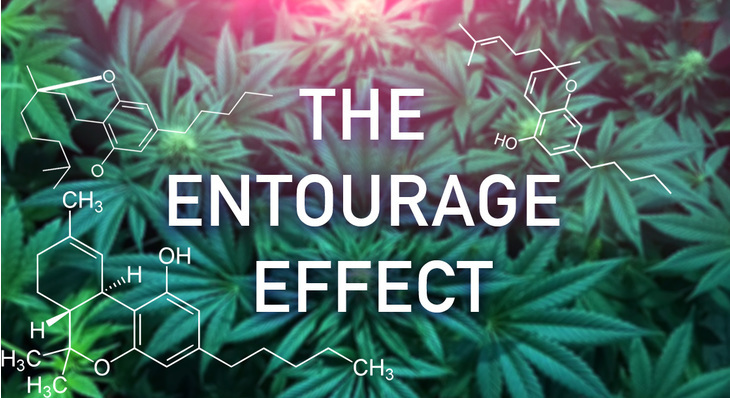 In 1998, two Israeli scientists coined the phrase “The Entourage Effect” to describe their study findings that taking all of the natural chemicals found in cannabis are more beneficial than just taking a single molecule compound. Hemp has quite an entourage of phyto-cannabinoids, which are unique chemical compounds. The ring leader is cannabidiol (CBD), the non-psychoactive cannabinoid that has shown to have the largest potential for wellness benefits in hemp. It’s accompanied by other cannabinoids such as tetrahydrocannabinol, tetrahydrocannabivarin, cannabigerol, cannabichromene, and cannabinol. This merry gang of cannabinoids works like a lock and key with the Endocannabinoid System, a vital receptor system found in the immune system, the central nervous system, the brain, organs, connective tissue, and glands. This relationship affects many of our crucial biological processes like sleep, digestion, cognition, appetite, pain management, hormone health, and inflammation response to name a few. Also, the role of terpenes, a huge class of aromatic and flavorful organic hydrocarbons, is being widely explored as having a significant influence in whole plant care. Terpenes are the building blocks for plant hormones, sterols, pigments, and cannabinoids. They’ve shown to cooperate with the ECS and the immune, nervous, and gastrointestinal systems. About 20 flavonoids, a large phytonutrient family, have been identified in the cannabis plant. They’re well known for producing the non-green color in plants, like the red in raspberries and also, they’re high in antioxidants. Together with cannabidiol, terpenes, and other cannabis phytonutrients, hemp flavonoids consumption is being researched just like the flavonoids in our food. With so many incredible medical and technological advances in our lifetime, it’s often thought that natural products are less sophisticated, less efficient than those synthesized in a lab. In 2015, a ground-breaking Israeli study demonstrated some exciting findings when it comes to clinical applications of whole plant cannabidiol vs. single-molecule cannabidiol. Further studies need to be done to underline the exact reason for the heightened effectiveness. At this time, researchers believe the answer lies in the relationship between the cannabidiol, secondary phyto-cannabinoids, and non phyto-cannabinoids found in the hemp plant. Which CBD Serving Size is right for me?